The films of David Lynch have long been something of a catchall for scholarly analysis; easily moulded to suit a variety of interpretations and critical possibilities. Justus Nieland is quick to acknowledge this malleability in his study of the director, pointing to the peculiar intersection in which “the evolution of Lynch’s filmmaking career…dovetailed with the academic consolidation of postmodernism” (2). But beyond the work of cultural theorists such as Frederick Jameson and Slavoj Žižek, Lynch’s films have also served as the critical object for an ever-expanding canon of investigation in the fields of gender (Martha Nochimson), psychoanalysis (Todd McGowan), artistic form (Greg Olsen), and auteurism (Michel Chion, Antony Todd) among various others. Extrapolating the pliability of the director’s work through the metaphor of plastic – which he describes as “the prime matter of Lynch’s filmmaking, essential to his understanding of cinema”(2) – Nieland’s study proceeds with an exploration of the design elements of Lynch’s films. Beginning with Eraserhead (1977), which he describes as “Lynch’s first great poem of interiority”(10), Nieland charts the filmmaker’s fascination with internal and external states and the tenuous boundaries that often separate one from the other. For instance, of the film’s memorable dinner table scene with its conversation of pipes and ‘tiny, man-made chickens’, Nieland astutely notes how Lynch “conjures a world whose plumbing collapses organic and inorganic processes, natural and mechanical orders, hopelessly troubling the security of the domestic interior in the process”(12). The section on The Elephant Man (1980) continues a similar line of enquiry with Nieland finding in the film’s architectural design a means by which Lynch stages the limits – and in the case of John Merrick, the impossibility – of a bourgeois existence. Highlighting the film’s confluence of private and public spaces with respect to its central character, Nieland observes how certain sequences, such as the nightmarish montage that begins with Merrick, traversing through a series of static images and camera movements, before concluding with Doctor Treves, “replays, in specifically nineteenth-century terms, the infrastructure of the violated interior”(26). While Nieland’s project works well in illuminating the meanings embedded in Lynch’s mise-en-scène, the analysis of Blue Velvet (1986), for which he notes, “for better or worse…persists as Lynch’s masterpiece”(28), also doubles as a compelling defence of the director’s aesthetic against charges of depthlessness. Questioning Clement Greenberg’s criticism of kitsch as “all happiness and sensation with no work”, Nieland contends that in the case of Lynch, the application of kitsch (on display here and elsewhere in the director’s films) produces a different result: “rather than waning or burning out, room tone increases in intensity and complication in the presence of pseudo-art – no easy trick” (32). 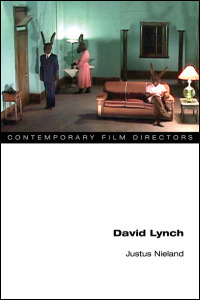 The debate over the role of affect in Lynch’s films is taken up with greater detail in the subsequent section of the book, which explores the tonal ambiguity characteristic of much of the director’s work. According to Nieland, the importance of these tonal shifts goes beyond the immediate moment of spectatorship to questions over Lynch’s artistic legitimacy. As he writes, “To keep affect ambiguous or indeterminate is one way of generating affective intensity, but it is also a way to maintain the enigma of personality, to assert claims to aesthetic authenticity and distinction” (63). Leading off with a detailed discussion of Wild at Heart (1990), Nieland likens the film’s use of black humour to that of surrealist, André Breton, where its function was to transform “the traumas and contingencies of the material world into sources of subversive enjoyment”(77). In this regard, his description of Wild at Heart’s “dominant affective key” as “anxious airspace” (78) seems succinctly accurate. Similarly, Nieland’s exploration of Mulholland Drive (2001) yields (or perhaps restates) one of the key observations in understanding the production of affect in Lynch’s cinema. Borrowing from George Toles’ excellent analysis of Betty’s audition scene, where he argues the spectator is left at the mercy of “a sincerity hatched at the core of artifice”, Nieland returns to the book’s keys threads – plasticity and the relationship between internal and external – to explain Lynch’s cinematic affect as a structural form. As he states, Lynch understands “emotional sincerity as a spatial dynamic, something nested in a plastic environment with an outside and an inside, a periphery and a mysterious center” (107). By drawing attention to the tonal ambiguity evident in this scene (and the later Club Silencio sequence) Nieland puts forward a compelling case that explains, at least in part, the popularity of Lynch’s films as the work of a “skilled illusionist”(108). The concluding section of the book focuses on David Lynch’s relationship to surrealism. Foregrounding the ‘organic’ in Lynch’s work in terms of both content and artistic approach – his “biologizing of media” (113) – Nieland begins by retracing his early films such as Six Men Getting Sick (1966) in order to locate the director within a surrealist tradition. Reiterating the filmmaker’s preoccupation with domestic unease such as that found in the Kafka-inspired The Grandmother (1970) with its “strange nature of home-bodies, less human beings than creatures” (120), Nieland provides a clearer picture of Lynch’s artistic lineage leading back to those films examined previously in the book. However, the inclusion of The Straight Story (1999) in this section, and Nieland’s (Lynch-inspired ironic?) attempt at linking the film’s depiction of “life, family, community, environment” to “an organism imagined on the model of the good machine” (125) feels less convincing. The final entry in this section is a well-considered analysis of Inland Empire (2006) – Lynch’s first foray into digital media – that demonstrates both the director’s ongoing preoccupation with creating a visual sense of ‘un-homeliness’ and re-confirms his surrealist tendencies. Once again, the use of a digital medium with its grainy denaturalised imagery has specific implications in terms of Lynch’s production of cinematic affect. As Nieland explains, “Like a long tradition of avant-garde artists captivated by the non-naturalistic image, Lynch seeks the reality of the cinematic experience on a phenomenological level where our involvement in the image deepens as the picture itself becomes less real” (140). Though more than six years have passed since David Lynch completed Inland Empire, the body of writing dedicated to the director’s filmography has steadily continued to expand. Justus Nieland’s study is something of a revelation, not simply because it represents one of the most sophisticated contributions in this area, but for the way it breathes new life into a canon that had appeared to have reached a point of critical exhaustion. That is an impressive achievement in itself.